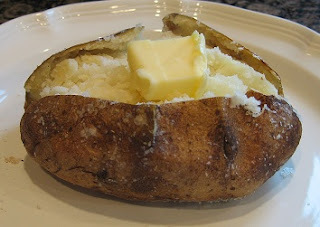 Any potato can be baked, but for the perfect baked potato with the desired flaky texture, it is recommended that mature, baking-type potatoes such as the Russet potatoes be used. Russets are known as a starchy potato, a baking potato, or a mealy potato. The starch gives the potato it's characteristic fluffiness. Make sure that the skin has a nice even brown tone without a greenish cast. Inspect the potatoes thoroughly to make sure that there aren't any significant bruises, discolored spots, or sprouts. A sprout of any size can be toxic, but you'd have to eat many sprouts to get sick. Do not buy if they have sprouted or have a green tint to the skin. The same is true for potatoes that turn a greenish hue. A potato in this condition is "light-struck" which causes a build-up of a chemical called Solanine. This is a natural reaction to the potato being exposed to too much light. The green part, if eaten in large quantity, can cause illness. When baking a large amount of potatoes at one time, choose potatoes with uniform shapes and sizes; they'll cook more evenly and get done at the same time. Adjust the rack in your oven to the middle position and preheat oven to desired temperature (see chart below). Rinse and scrub (I use a stiff-bristled brush) each potato under cold running water, as you will be eating the skins of these perfect potatoes. Don't soak the potatoes (that will make them soggy and don't use hot water or you'll start cooking the outside and the inside won't catch up). NOTE: A majority of the vitamins and minerals are found in the skin, so don't throw it away. Dry each potato thoroughly with a clean towel. Look the cleaned potatoes over and remove any bruises or discolored spots with the tip of your knife. Pierce each potato deeply with a fork or sharp knife four times on each side at approximately 1-inch intervals. This will allow steam to escape during the baking. If you don't pick the potatoes, they may explode during baking in your oven. You don't want this to happen as it makes a terrible mess in your oven! NOTE: Wrapping the potato in aluminum foil will produce a soft skin (not crispy). Technically this is steaming rather than baking (as the moisture in the potato remains trapped) and the light, flaky texture will be missing. The texture of a steamed potato is entirely different from that of a perfect baked potato. Save yourself the trouble and expense of wrapping in aluminum foil and serve perfect baked potatoes. My suggestion is to NEVER use aluminum foil when baking potatoes! For a soft skin, rub the potato with olive oil, vegetable oil, or butter over the skins. 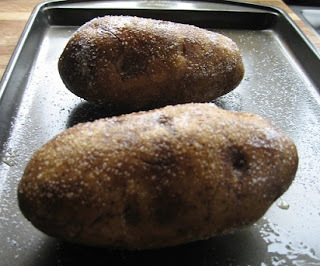 NOTE: I like to roll the potatoes in coarse or kosher salt after rolling in the oil and before baking. Place coarse salt onto a small plate. Roll potatoes lightly in the salt. The skin is so yummy to eat! 45 minutes at 400 degrees F.
60 minutes at 350 degrees F.
90 minutes at 325 degrees F.
Place the potato directly on the oven rack in a preheated oven. Potatoes are done if tender when pierced with a fork and the internal temperature reaches 210 degrees F. You can also use a meat thermometer to test for doneness. You can also test for doneness by gently squeezing the middle of the potato (using a pot holder). If it gives in easily to your touch, it is done. NOTE: If you're cooking more than 4 potatoes, you'll need to extend the cooking time by up to 15 minutes. 45 minutes at 375 degrees F.
60 minutes at 325 degrees F.
90 minutes at 300 degrees F.
Convection ovens cook up to 20% faster than regular ovens. Also, the food in a convection oven is cooked at a lower temperature than in a regular oven to achieve the same results. The general rule is to decrease your oven temperature at least 25 degrees lower than a regular oven. You can also use a meat thermometer to test for doneness. Potatoes are done if tender when pierced with a fork and the internal temperature reaches 210 degrees F.
This is the type of thermometer that I use in my cooking. I get many readers asking what cooking/meat thermometer that I prefer and use in my cooking and baking. I, personally, use the RT600C Thermometer (show in the photo on the right). To learn more about this inexpensive excellent thermometer and to also purchase one (if you desire), just click on the underlined: RT600C Thermometer. I tried this today. Potatoes came out perfectly just like Outback. Potatoes were delicious! We used 4 medium sized potatoes at 350 and cooked them for 1 hr and 15 mins. YUM! I did 9 small/medium potatoes at 425 for 1hr15min. Worked out perfect. 8 medium to large Red Potatoes scrubbed & boiled with the skins on 1 cube butter 1/2 container sour cream 1/2 lb bacon cooked & crumbled Shredded cheese to taste Mix all. This makes a large batch, feeding approx. 14-16 people depending on serving size.